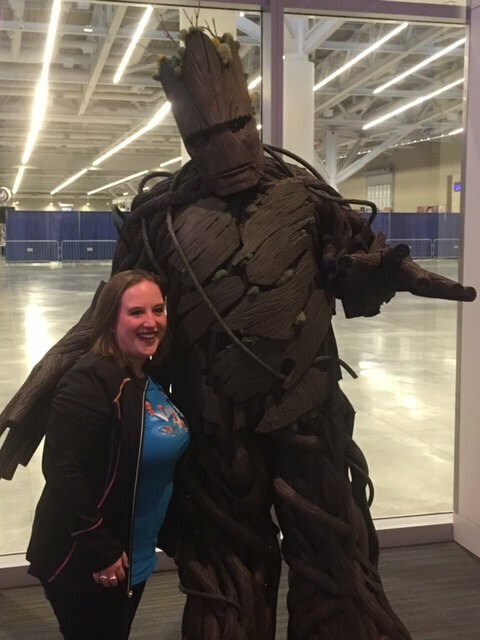 My first experience at Wizard World Cleveland as a vendor was exceptional! Going into the event, I was anxious. So anxious that I barely completed anything over five days. The anxiety rattled my gut as armies of dwarves mined my intestines, triggering shock waves. Those vibrations reverberated through my body. The energy took control of my focus, destroying any ability I had to write, work, read, or even focus on tv. If you struggle with depression and anxiety, you know exactly what I mean. The day we left for the event all of my anxiety vanished. This is how it works when I’m doing the right thing. My anxiety can cripple me, but if I’m on the right path, it disappears when it comes time to act; sky dive, snorkel with jelly fish, walk around Tokyo alone, whatever it is, my anxiety will disappear if it’s right for me. 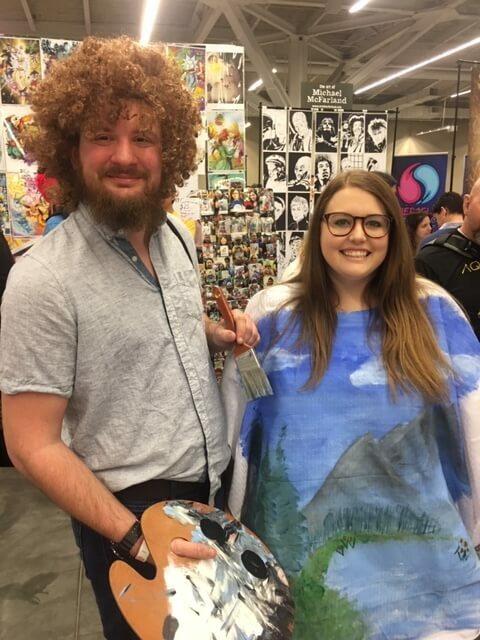 Bob Ross was my second favorite costume. I originally thought this was my winner, until I saw Groot. I didn’t know what to expect from the convention community. Would the vendors be friendly? Would the staff be helpful? Would the visitors be accepting? Yes to everything. I was most impressed with the vendor community. This a community that welcomed us with open arms, giving us tips, tricks, and insights into the convention world. I feel like everyone was open to building relationships, even friendships. Here are some awesome people we met at the convention. 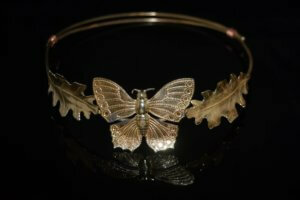 Many sell their items online if you would like to purchase something for yourself or as a gift for someone else. Vendors, if you’re reading this and not present, my apologies. We met a ton of people and tried to remember names as best we could. Jed was our neighbor vendor. He’s an LA artist who loves Batman and bunnies. His work is beautiful. We enjoyed conversations about conventions, art, music, and more. Billy creates WWII era art… that sounds kind of dull. Let me try again. Billy creates WWII era art with STAR WARS and SAMURAI WARRIORS! These pieces are astonishingly realistic. He was our booth neighbor. We didn’t get to talk much, but he was very helpful and friendly when we did. Need a comic a book? 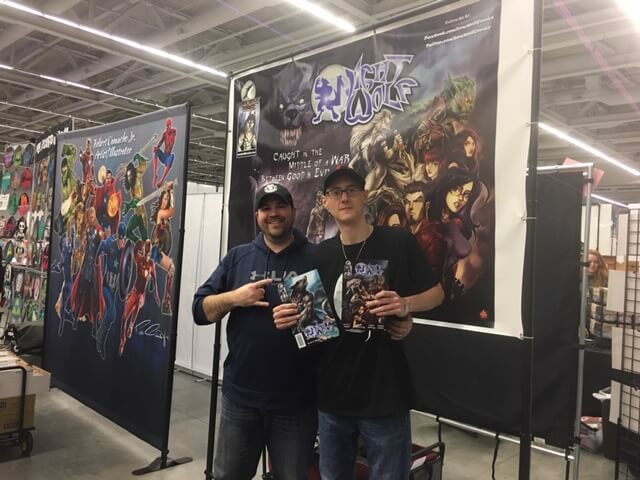 Rob writes Lone Wolf, a supernatural comic book series. I haven’t read them, yet and will update this page as soon as I do. You can find a picture below with me holding the two signed copies I purchased. The artwork is stellar. The story he pitched grabbed me right away. 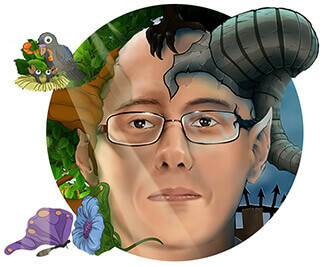 Elisha Capie creates art on the darker side of life. Some of her work is created on old book pages, giving it an antiquated feel. 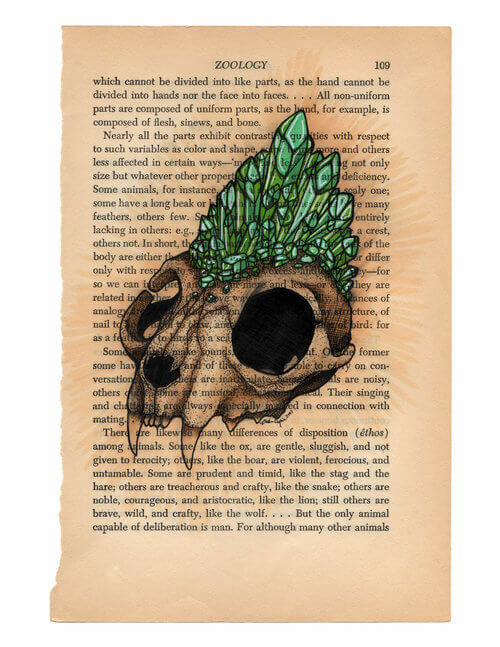 And when those book pages list out medical advice with skulls drawn on them, the artwork becomes even more awesome. Her husband, Will, is a Star Wars nerd. I wish there had been time to talk with Elisha and Will more. Hell, I wanted to talk to all of these vendors more. Everyone had interesting stories. Elisha has some great photos of her work here. We sat across from James and Brandon at the event, staring at their booth. They probably found it a bit unnerving. We couldn’t take our eyes off James’ artwork. 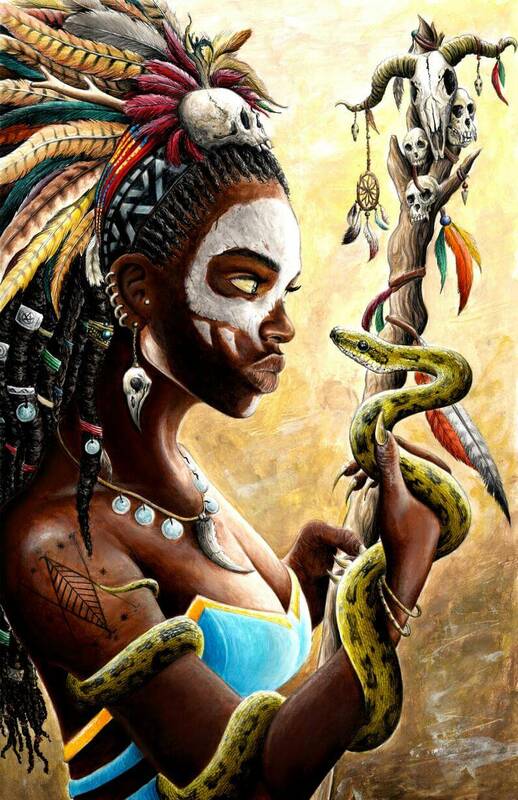 I plan on buying a couple prints, especially the Voodoo Queen. 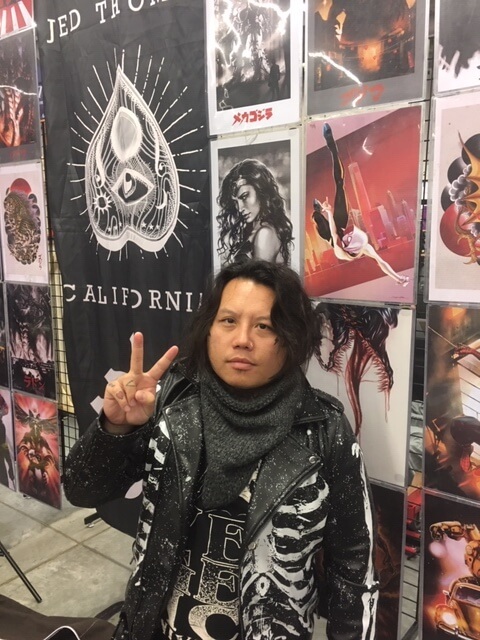 Brandon sells quality jewelry and makes handmade drums while his girlfriend cosplays, drawing people to their booth in her costume. Amanda is an amazing artist with beautiful abstract works. After we setup, we introduced ourselves and learned a bit about her adventure in Cambodia. 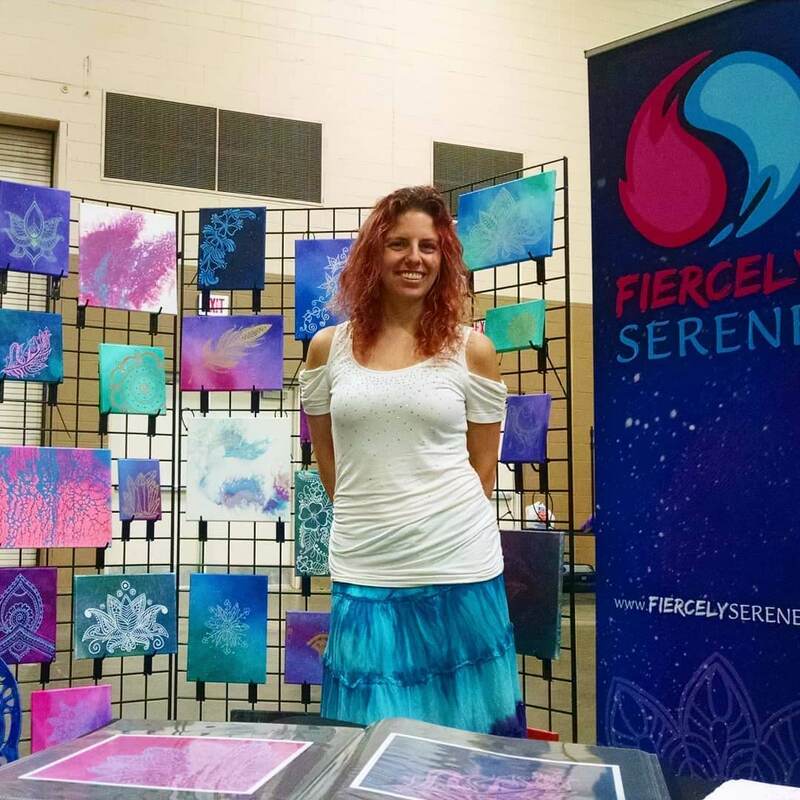 She offered us travel and convention tips… then we stared at her artwork from across the aisle while trying not to be creepy. Who loves tea? I love tea! 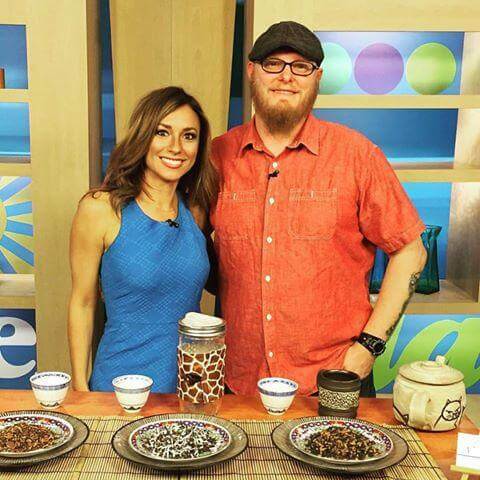 Chris, the Tea Dude, sells quality homemade teas. Kat purchased a couple while I was watching the table. Chris came by and introduced himself. He was super friendly. I hadn’t drank a cup of tea in days. Smelling Chris‘ tea was like a drug addict getting his fix. I need my tea! 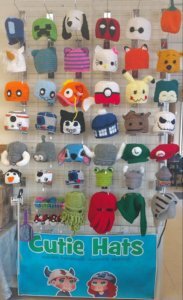 Jason from Cutie Hats offers a ton of great hand knit hats and goodies. He was selling some sweet t-shirts. Kat grabbed me one with Batman interrogating Deadpool. She was able to talk with him more. He needed help at his booth from time to time and she would lend a hand. Who doesn’t want a crown? Moria Silver creates crowns and other metal objects that all fantasy geeks want. We almost bought one, then realized Kat’s skin would eat through the metal. She’s one of those people with skin that destroys rings, necklaces, and other jewelry, corroding and eating away the metal. I think I’ll pick one of these up eventually. Ok… this one caught me by surprise. No joke. Don’t enter this website if you are easily disgusted with the horrifically torn apart remains of teddy bears. Jay takes teddy bears, surgically tears them apart, and makes them move. These teddy bears will show you their insides… it’s awesome!